This is a story about one of my ancestors, Alfred Hastings, who moved from Norwich to Newcastle-Upon-Tyne and then to Newport. Firstly, he was born in Norwich as the illegitimate son of Christina Hastings in 1830, before being baptised on the 3rd February 1831. In the 1841 census he is not with family, still living in Norwich. He next pops up in Newcastle in the 1851 census as a tailor living as a lodger to the Middleton family. 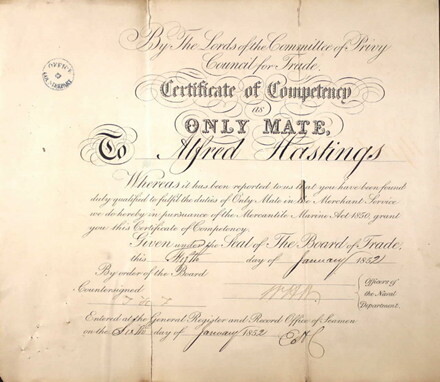 Then on the 5th January 1852 he becomes an 'Only Mate' in the Merchant Service, as shown below. However to become an 'Only Mate' he must have served for 5 years or more, so he probably joined in 1847. Also, he probably would have had to pay £1 to be examined, equivalent today as £97.60. Later that year he married Mary Ann Walker Swan and had his first child, a daughter, called Elizabeth Hewitson Swan Hastings. Although, weirdly on his marriage certificate his father is listed as Charles. 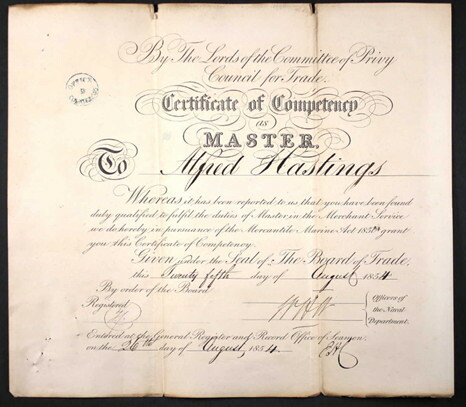 Then in 1854 he became a Master Mariner. This meant he was very skilled as he would have to tell the latitude by a star, etc. In 1855 he had his second and last child, Charles Henry William Swan Hastings. In the 1861 census he is away from the household, presumably at sea. In 1861, his wife Mary is living with the two children and her sister at 37 Howard St. in Tynemouth. I can't find him or his wife in 1871, but Elizabeth is living in Newport. In 1881, he and his wife are living at Ty Gwyn Farm in Llanvihangel-Llantarnam, Newport with their three year old grandson, via Elizabeth, Alfred Charles Holden Brunt and servant Eliza Bailey. Alfred is said to be a farmer. In 1891, The couple are still living on Ty Gwyn Farm and so is Eliza Bailey. In 1901, the couple are living together, still at the farm. However Elizabeth and three of her children are living there as well. Charles, Elizabeth's wife is living at 36 Alexandra Road, with another three children. However in 1905, Mary dies aged 78 and in 1911 Alfred is living with his granddaughter Laura. Two year's later, Alfred dies aged 83.
. The photo on the home page is from Duncan's blog, "Duncan Regnery and Ralphs Journey's".